Despite extensive empirical experience, there is both a scientific challenge and a technological need to develop an understanding of the mechanisms underlying the flow of grains. 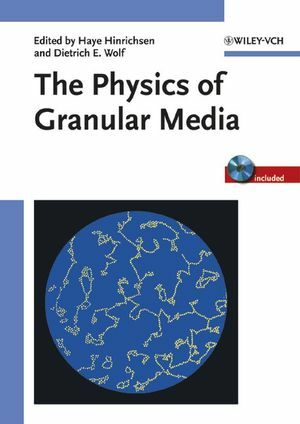 This new reference provides quick access to the current level of knowledge, containing review articles covering recent developments in the field of granular media from the viewpoints of applied, experimental, and theoretical physics. In short, a must-have for advanced researchers and specialists as well as a useful starting point for anyone entering this field. Dr. H. Hinrichsen holds a temporary professorship at the University of Wuppertal. He is head of the DFG project "Influence of electrical charges on the stability of granular matter in suspension". Prof. Dr. D.E. Wolf is a well-known scientist from the University of Duisburg. He has worked for many years on granular matter and is a widely recognized expert within this community. The enclosed CD-ROM contains the figures of the articles, many of them colored, as well as related movies.